"A new ultra-wideband antenna printed on paper or plastic can harvest ambient energy, enabling wireless sensors to tap into electromagnetic currents in the air around them. The device captures energy from a wide spectrum of frequencies, converts it to direct current, and stores it in capacitors or batteries. Researchers at Georgia Tech scavenged sufficient microwatts to power a temperature sensor, using the ambient energy produced by a television station signal that was a third of a mile away. More powerful systems that tap into multiple wireless bands could generate one milliwatt or more -- enough to power small wireless sensors and microprocessors. Researchers hope that when it’s combined with advanced capacitor technology, the device could provide up to 50 milliwatts. 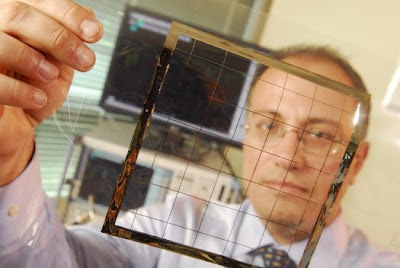 [Here] Georgia Tech School of Electrical and Computer Engineering professor Manos Tentzeris displays an inkjet-printed rectifying antenna used to convert microwave energy to DC power. This grid was printed on flexible Kapton material and is expected to operate with frequencies as high as 10 gigahertz when complete..."